Ready to make a difference while going to school? We believe you can make a difference at any age. At our retirement communities, you can gain valuable work experience, meet wonderful people of all ages and earn extra spending money. We understand school is your main priority (as it should be). That’s why we offer part-time and as-needed schedules with flexible hours. Along with your school schedule, you can gain worthwhile experience in a professional yet home-like environment. Plus, thrive and learn from co-workers with different backgrounds and experiences—even different generations. We welcome non-traditional students too such as individuals being home-schooled, attending cyber school and returning to school. And above all, we look for individuals who are motivated, dependable, cheerful, patient and respectful and of course enjoy spending time with seniors. We also offer internships when opportunities arise within the school year or in the summer. Meet some of the great individuals who participated in our programs. For which role(s) can I apply? For students ages 16-17, we offer Dining Associate opportunities in our campus dining rooms. Individuals 18 years or older without a high school diploma, GED or active CNA license can consider Dining and Housekeeping positions. Individuals 18 years or older with a high school diploma, GED or active CNA license are eligible for all our entry-level or related positions. If you are at least 17 years old and have an active CNA license, you are eligible for all our entry-level or related positions. And for all, we provide on-the-job training. We offer part-time and as-needed (PRN) schedules including evenings, weekends and holidays to accommodate school commitments and breaks. Do you offer job advancement? Absolutely. We want our co-workers to thrive. 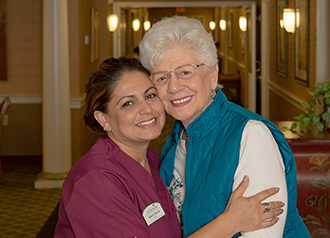 We offer career paths in all roles including Dining, Culinary, Personal Care and Housekeeping to encourage co-workers to grow, develop and earn increased wages through hands-on experiences, right in our communities. Even more, we post all our positions internally first to give co-workers prime consideration—we love to hire from within! We are so proud of the many success stories of co-workers who started working with us while a student and continued their career path after graduation into permanent positions ranging from direct-care to management. I am interested. How do I apply? Visit our Careers page to view available opportunities at specific campuses and apply online.